Industrial Emission Control Systems Market size was above USD 13 billion in 2015 with forecast to grow over 6% from 2016 to 2024. Environmental concerns due to rapid industrialization along with looming threat of global warming are posing serious issues for the development of sustainable future. Global warming has become focal point of global geopolitics. Industries across the globe have been working towards implementing emission control systems to adhere with stringent regulations pertaining to the emission of harmful wastages having a negative impact on the environment. Predominantly industries emit pollutants which include toxic materials such NOx, Sox, VOCs, particulate matter amongst other pollutants which are extremely harmful for the environment. A high proportion of these pollutants has led to serious health concerns. It is imperative for industries to install technologies which perform collection, conversion and elimination of these harmful substances. This has provided a major stimulation for the growth of industrial emission control systems market share during the forecast period. Emission control systems are extremely critical for the industries and selection of suitable devices lies at the helm due to nature of pollutant and industry where the devices are to be installed. Controlled emission is achieved by periodic replacement of old devices. Traditionally power plants have regularly installed such devices which have a life of around 10 to 15 years. The power generation industry has been a major contributor due to replacement of older devices. This has been a critical factor for the growth of industrial emission control systems market. Governments across the globe are striving to reduce environmental damages be developing policy frameworks which will motivate the implementation of various pollution control technologies. Governments have collaborated with various environmental organizations for developing standards to control excessive emissions in the region. These standards have been instrumental in the expansion of the industrial emission control systems market size. As the population continues to grow, the demand for energy is bound to increase especially in the emerging markets across Asia Pacific and Africa region. The rapid industrialization is supported by the huge power generation plants along with infrastructure development activities which are supported by the cement, metal along with chemical and petrochemicals sector. These development activities get impetus from increasing international trade as a result more developing economies with low labour costs have become manufacturing centres. These regions are expected to significantly contribute to global industrial emission control systems market share growth. Electrostatic precipitators are one of the most essential devices which are used to remove particulate matters. These devices are predominantly used in power plants, steel, paper and cement industries and is expected to exhibit to expected to witness a significant gain of over 6% by 2024. Absorbers are deployed to remove toxic gases which are essential at chemical and petrochemical plant. The absorber is expected to grow rapidly at over 8% from 2016 to 2024. Scrubbers form an essential component of wet and dry flue gas desulfurization plants for the scrubbing of harmful Sox and other gases. Scrubbers constituted around 15% of the total industrial emission control systems market size in 2015. Power plants are one of the major pollutant emitting industry, the harmful gases, corrosive acidic or basic streams, particles and vapors have been damaging the nature. It is also the major industry where majors to control such emissions have been implemented at the highest level. Power plant industrial emission control systems market was valued at over USD 5 billion in 2015 and is expected to witness a rapid growth over 6% by 2024. 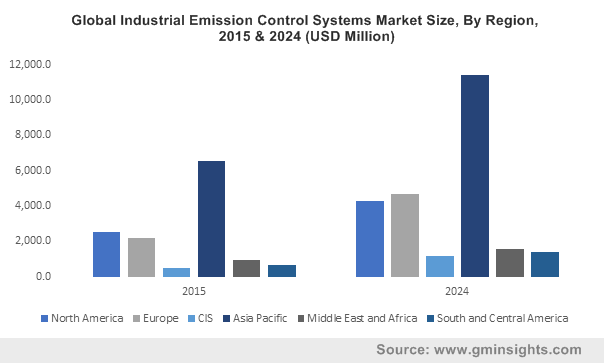 Industrial emission control systems market size from cement was valued over USD 1.5 billion in 2015 and is expected to witness a growth subject to increasing construction spending across the region. Brazil is expected to witness a significant growth subject to rapidly improving economic scenario along with growing mining and oil and gas exploration in the region. Chile industrial emission control system market is expected to reach over USD 200 million by 2024. For Europe industrial emission control systems market size, Germany will grow at an impressive rate of over 8% from 2016 to 2024. Significant industrial development in France, Spain and Italy will further contribute to growth. France will exhibit impressive growth rate of over 9% during the forecast period supported large industrial power projects and easing of economic conditions. Increasing population coupled with industrial growth is likely to favor the industrial emission control systems market in China. Government guidelines to reduce the emission content will positively affect the business. Presence of large number of international players in U.S. have created awareness regarding system upgradation and installation of technologies to limit pollution. U.S. industrial emission control systems market share is expanding rapidly and is expected to reach over USD 2 billion by 2024. Major industry participants include Johnson Matthey, BASF, Babcock & Wilcox Enterprises, Amec Foster Wheeler, Mitsubishi Hitachi Power Systems, Ducon Technologies, General Electric Company, CECO Environmental Corp, Thermax Ltd, APC Technologies, Auburn Systems, Air Clean LLC, Fujian Longking Co, Hamon Corporation. Industries are the major sources of stationary pollution such as smelters, power plants, cement plants, refineries amongst others releasing harmful contaminants in to the atmosphere. These contaminates are controlled using various technologies. These systems destroy contaminants by either thermal or catalytic combustion or convert toxic substances in to less harmful chemicals through technologies such as selective catalytic reduction. The market for these technologies holds a high significance considering the environmental benefits of implementing such systems.